P&O Ports, a subsidiary of Dubai government’s Ports, Customs and Free Zones Corporation (PCFC), will start operating the container terminal in the Port of Sète in the south of France in early 2018, writes GulfNews. Earlier, in July, P&O Ports won a three-year management contract to operate the port’s container terminal with a draft of 14.5m, a 457m quay and adjacent two hectares of land. The contract may be converted into a long-term concession in the future. During a visit to Sète last week, Sultan Ahmed Bin Sulayem, chairman of PCFC and DP World Group owning P&O Ports, met with Carole Delga, President of the Occitanie region, where the port is situated, and with Jean-Claude Gayssot, the Port Authority president. He noted that the start of operations was due in early 2018 and encouraged those with an interest in the Sète container terminal to contact P&O Ports so they can prepare services for future customers and partners. The Port of Sète is a deep draft port, handling general, break-bulk, Ro-Ro, refrigerated cargo, containers and livestock, it also contains cruise and ferry terminals, a marina, cement handling facilities and an agro-industrial complex. It is connected by feeder routes with the ports of Italy, Spain and France, with access to major hubs throughout the Mediterranean. The port is strategically located as an entry point to the landlocked region Auvergne-Rhône with direct inland waterway communications. As to the possible ways of development of the Sète container terminal, Sultan Ahmed Bin Sulayem mentioned when signing the management contract in July, that at the beginning it would continue to primarily cater for feeder services in the eastern Mediterranean, the Maghreb region and North Africa. But once development takes place the terminal can expect to see more multinational shippers use its services with other international destinations added over time. 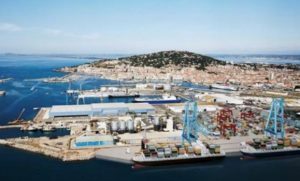 “Port De Sète has great potential and is ready to become another gateway port for France,” he said.